To help pay the out-of-pocket expenses that are due at the time of service, we are pleased to offer a variety of flexible and convenient payment solutions. We are dedicated to helping you through the billing process. Together, we can ensure that your experience is as easy as possible allowing you to focus on getting healthy. If you have questions related to your bill or insurance, please contact a patient account representative at 877-442-2993. Thank you for your interest in paying your bill with Innervision MRI & Imaging. Multiple options make paying your bill quick and easy - select the one that works best for you. Call Patient Account Services at (877) 442-2993 and we will assist you. Have your billing statement and payment method ready when you call us. Send a one-time payment or scheduled payments from the back account you choose. Your time is important – to you, your family and us. That’s why screening mammograms performed at our locations generally take less than 30 minutes – less time than a typical doctor’s office visit. Our Eastside office is located off of I-385 close to Haywood Mall. We are a full service modality diagnostic imaging facility that offers not only MRI and CT imaging, but also Fluoroscopy, X-ray and Ultrasound. We have onsite board certified radiologists that specialize in general radiology, neuroradiology, musculoskeletal, and women’s imaging. In addition we offer calcium cardiac screening and now carotid IMT ultrasound screening to assess risk of heart disease and stroke. Our large bore MRI can accommodate patients that are claustrophobic and we offer 3d reconstruction views for both MRI and CT studies. All of our locations have convenient parking and reserved parking for handicap in close proximity to the front door. Before your scheduled appointment, we make sure that any prior authorization is obtained through your insurance. We will also give you a courtesy call to not only go over what your insurance will cover and any out of pocket expenses, but go over any screening questions specific to the scan that you are scheduled for. This will also give you an opportunity to ask any questions regarding your scan. We pride ourselves providing excellent customer care, and when you come in for your appointment, you will be greeted by our patient coordinators; most patients are in and out of our offices in about an hour. All of our technologists are registered in their specific modality, with some having dual registry. We bill globally, which means that you will only receive one bill that includes the scan and the radiologist interpretation. In most cases we ensure a report turnaround to your ordering provider in 24 hours. Please feel free to give us a call if you have any questions on what to expect for your appointment. Our area Manager is Roger Bolt, and Marketing representative is Ashley Hawkins. 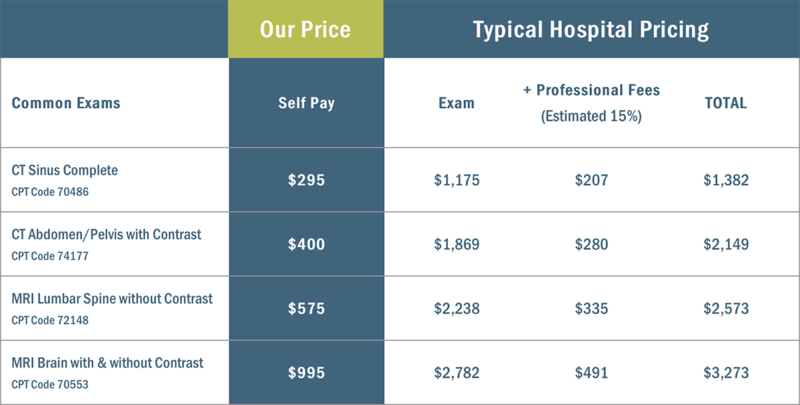 We value convenience, quality and affordability for both patients and referring providers. Please let us know how we can assist you with your imaging needs.